There has been absolutely so much going on that I can't keep up. I'm lucky if I jot notes down in my garden journal. Can I put there that my son has lost his first two teeth and remember it? I've given up on being the kind of parent who writes down the funny things they say; the least I can do is keep track of big milestones. One milestone seemed to happen really quickly here. 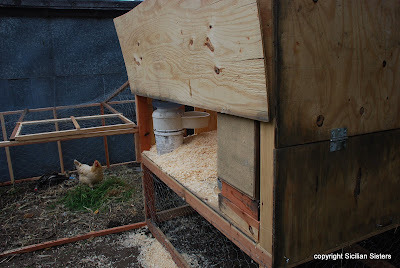 After the chickens were put on restriction, we had to make them a new, contained container. 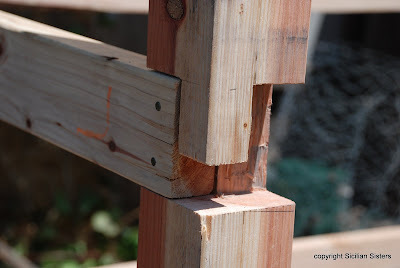 On one of the hottest days in the year so far, Eric thought it would be a nice chance to practice some fancy Japanese-style joinery. I got to dig holes. Being the unskilled labor kind of stinks. Thank goodness for sandy soil. In one week, we went from tank tops and buckets of sweat to sweaters under jackets. The coop area went from a prison to this nice (although sorely in need of painting -- maybe I'll think of a way to indulge my wanna-be muralist side), but more importantly, secure, coop. It was finished on a raw, cold pair of days. 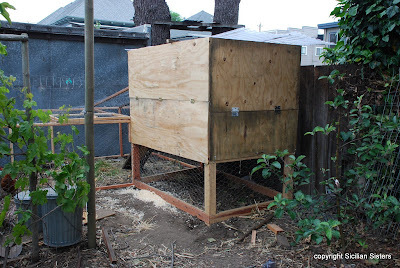 The old coop was big enough to walk in, but this one has a hatch that serves for both egg removal and clean out -- we raised the nest boxes just above a the height of a rake. The old coop had a dirt floor, which meant it was filled with dust-covered spiderwebs. 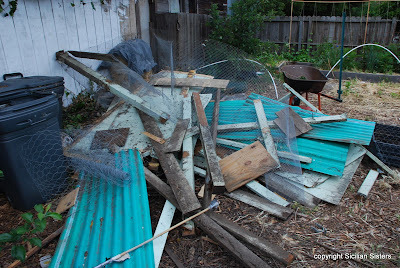 Now that old coop is only a pile of needing-to-be-sorted-and-reused lumber and screen. 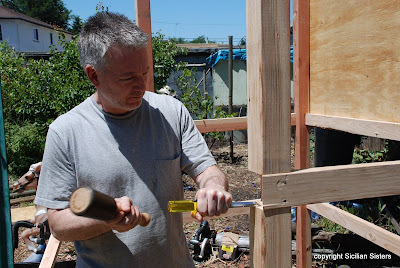 A side panel lifts for food and water changing. We're still working on securing the roof, made from almost-clear panels for more light, and the food will be suspended from one of the wooden supports for that. There's got to be a better way to secure the water, also. 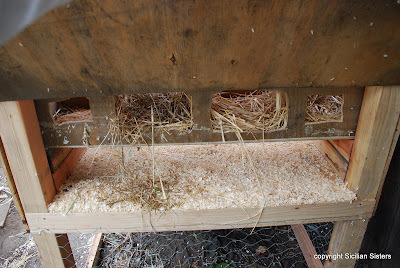 The roof will ideally have some hardware-cloth screened vents on each end, since the coop is so tight. When the little girls get in there too, there's going to be a lot of body heat inside. There's a hatch in the pen for scrap and weed and other chicken amuse-bouches, and the little ramp ladder leads to a door that slides, guillotine-style. And, we got it done in time for the first city bicycle coop tour today! 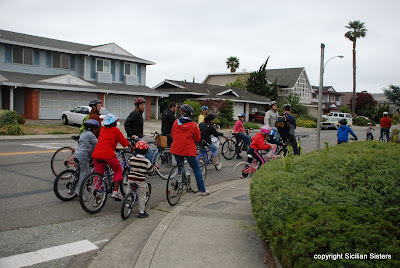 What seemed like a whole bunch of us roamed around and visited seven different coops. It was interesting to see the different approaches folks have to the issues of safety, convenience, health, and access. I bet there are many more coops on our little island -- maybe next year the Tour de Coop will be even bigger. The chickens at our house seemed to greatly appreciate their new digs. What's this pile of damp feathers? 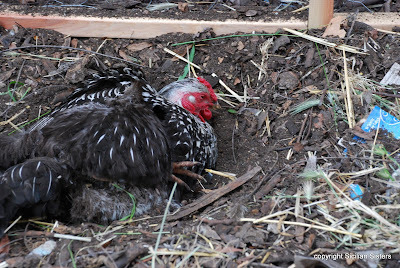 Why, it's Gondor the hen -- I didn't think she was going to leave that dirt bath all day long. 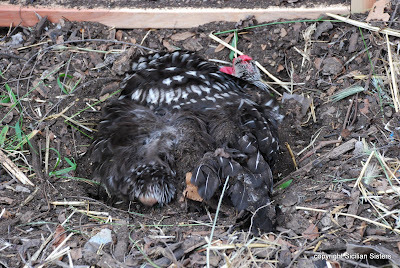 But not only did she, by the time I went out to lower the door after a day full of friends and good times, I heard only quiet contented clucking from the hens, all arrayed on their perches for the night. The tour de coop sounds like so much fun! Your new coop looks terrific. Nice coop. 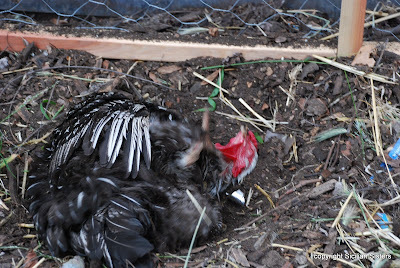 The dust bath photos are funny. I'd love to have chickens but there is a bylaw against it here after the bird flu thing. I guess they don't think the natural birds can carry bird flu just the odd chicken coop in the city. Susan, it was fun. There were many children along. The next time we arrange one -- and we're talking about one on this side of the island -- maybe you'll be in town. Dan, that sounds like a perfect case for some citizen activism. Cities all over the US are revisiting their no-chicken rules. Maybe some folks in your area would like to make a presentation to a councilperson? I know we have a bird limit, but that's it. Oh, and no furry livestock, although you can have a whack of dogs. Go figure! And we're in a very urban place. The world is changing! Great job on the new coop! It sounds like you went from taller on the ground to more compact on legs? We're considering a move in the opposite direction and would love to hear your thoughts. What did you see on the Tour de Coop? 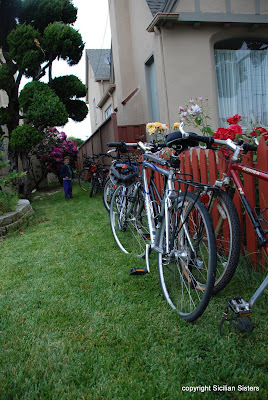 When we went on the Bay-Friendly garden tour, we were really struck by how much bigger everyone else's coops are! With our little coop, we were feeling like if they spotted us, someone would could all the animal protection on us! Today, though, our new neighbors allowed us to park the tractor under their plum tree. no ripe plums yet, but a great dirt-jacuzzi! Ktrion, we did. Turned out very few of us enjoyed walking in to the coop, and the chickens don't seem to care. They have less space all over -- it is going to be more crowded but again, their numerous escapes led me to the direction of much more secure vs. "let'em run free." 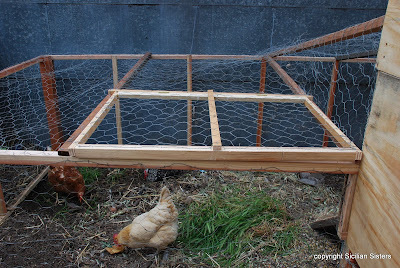 I love the idea of really being able to clean the coop. We had a wire shelf halfway up the other one to support the nest boxes, and their poop collected all over it. It was nasty and hard to chip off. I predict better compost with this method. I also, personally, like being outside the chicken zone. Chacun a son gut, I guess. On the tour, it was apparent that I have chickens uniquely committed to escape, as many runs had 3' tall fencing, with no reported problems. Go figure. A lot of folks used prefab. We go for massively over-engineered. Why are you going up and bigger? 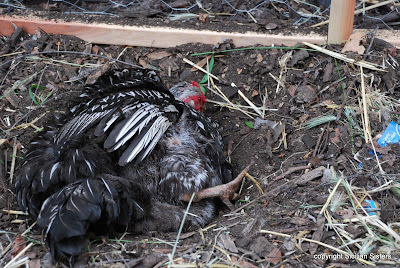 It's sounds satisfying: the hens clucking contentedly upon on their roost, in for the night. What a great day.